We all are very sad. Italian film director Vittorio Taviani, who with his brother Paolo Taviani created masterpieces of the Italian cinema has died today at the age of 88. The Taviani brothers are among Italy’s most well-known directors, with such acclaimed credits as Padre Padrone, La Notte di San Lorenzo, Kaos, Caesar Must Die and Wondrous Boccaccio. It is a great loss for Italian cinema and culture. To his family and his daughter, friend Giovanna Taviani , our deepest sympathy We decided to republish this article that the great director generously wrote for our magazine. It is the celebration of an island that he loved so much, Salina. 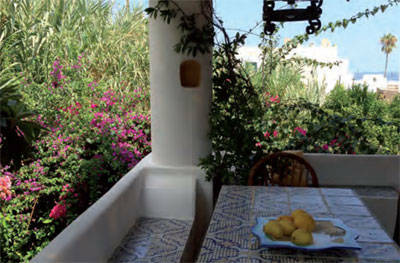 Salina as seen through the eyes of renowned film director who for many years has shared a house on the gorgeous Sicilian island with his brother Paolo, inseparable companion in work and in life. Salina isn’t our vacation home. Salina is an event in our lives. When my brother and I first set foot on the island almost 40 years ago, discovering this utterly unspoiled bit of nature also meant rediscovering our childhood – the wonder and amazement of childhood. We had known the great mystery of the Ligurian Sea during our long happy summers before 1940. Then the ruin of war, the abberant postwar period, urban speculation and the decline of the countryside erased any such images. Decades later we landed in Salina and that world we thought was lost reappeared before our eyes in all its glory and with all its secrets, immediately awash in fable and myth. 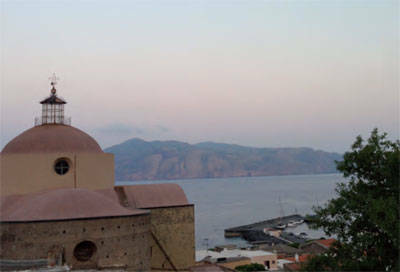 After all these years, in the evening, as Lipari grows more and more pink, we still sit by the sea expecting to see Ulysses’ ship pass by. Salina’s an event for all of us; for my brother and me, for our wives Carla and Lina, for our many kids. We first brought them here when they were very little. The house didn’t have a roof yet, and at night we would stretch out below one large roof and stare up at the stars in the sky. In that place, still unspoiled in many respects, the mystery of nature really enthralled our little familial microcosm. On August 10th, during the Perseids (known to Italians as the night of San Lorenzo), all of us – big and small – would wish on a shooting star. That year a secret was spilled; the youngest of the children couldn’t resist and confided his wish to us. “My wish is that daddy and uncle can make their film,” he said. The film we succeded in making – after a year and despite tons of setbacks – is called “The Night of San Lorenzo.” I realize I might be waxing a touch poetic, so I should say, less fancifully, that in Salina all of us feel like we’re part of a community that has welcomed us. A community in which our current friendships are bolstered even by the memory of those friends who aren’t around anymore. A community that still respects tradition but whose technology, city planning and culture remain modern. 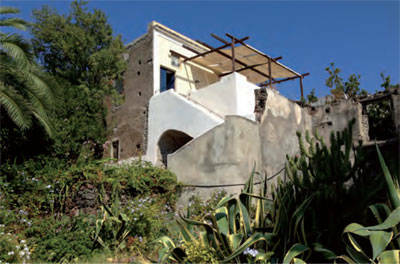 I’d add that our relationship with Salina and the Aeolian Islands is not based solely on our admiration and acknowledgment of its beauty, harmony and colors; it is also based on the heartbreak that we feel when faced with the abysses of the sea, the merciless violence of its storms, the almost sacred burden of its active and dormant volcanoes. An image of life’s complexities and ambiguities. That’s why Salina will never be just a vacation spot for us. 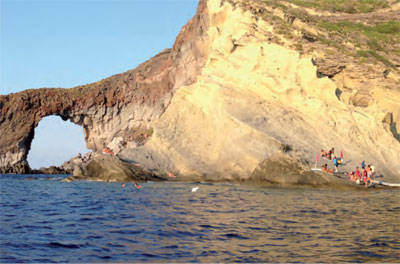 Salina is actually two islands for us, two experiences. The first Salina – already talked about – bore the enchantment of discovering a wilderness removed from industrial civilization. Wilderness may be an excessive word. It may smack of romanticism (deep down, Rousseau resides in all our hearts). Put plainly, living on the island back then meant rediscovering ancient ways, getting in sync with nature’s rhythms and tempos, even at its difficult aspects. It was an enchantment, on the other hand, that didn’t hide its dark side. The island’s centuries-old isolation led to poverty and abandon. The stacks of houses, the caper fields, the worn paths for herding animals: each told painful stories of emigration and goodbyes. Maybe that’s another reason days on the island can take their toll. We loved that island just as we love Salina today. The nature, the sea and the sky with its black volcanic peaks are the same. You have to focus your eyes on them. The economic circumstances and the urban layout have changed. Our day is the one we’re living now. In part because some places are like the people you love. You met her and fell in love many years ago. Time has passed. But in the way she looks now – different, changed – you can still see flashes of what she looked liked then.